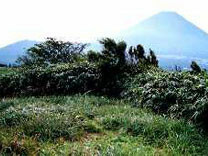 Viewing Diamond Fuji from afar. There is a legend that in the olden days there was a dragon guardian of Lake Motosuko that ran up this mountain to escape from the flowing lava of Mt. Fuji. And that is how it got its name, 'Ryuugatake' Dragon Peak, a mountain with an elevation of 1,485 meters. Get a panoramic view of Mt. 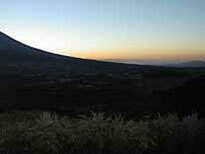 Fuji from the observation deck, and when blessed with a clear day, it is possible to see all the way to Suruga Bay. 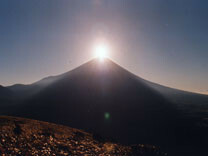 During December, the sun rising over the top of Mt Fuji can be viewed from our observation deck. Our observation deck is a popular spot for viewing Diamond Fuji. At about a five minute walk from our facilities, access to the climbing trails are outstanding.